Abdomen: Olive-Brown STS Tri-Lobal Dub or similar; six green peacock body feathers applied top and bottom of the hook shank in three sets. 1. Begin by applying strips of weight to both sides of the shank to form a platform to build your body. Apply olive-brown STS dubbing covering approximately ¼ of the shank. 2. Select two of the green peacock body feathers to be applied on the top and bottom, sandwiching the shank between them. Make sure they lie flat, facing each other, with the top feather extending a bit beyond the hook bend. The bottom feather has the shiny side facing down; the top feather has it facing up. 3. Dub the next 1/4 section of the shank. Apply another set of peacock feathers in the same fashion as the previous set. These can be slightly wider than the first ones, as we want the body to increase in width at this point. The length of the feathers should cover about half of the rear feathers. Repeat the application of two feathers one more time, again using slightly wider feathers than the previous set. 4. Attach a clump of pheasant tail fibers at the tie-off point for the body feathers and bind it down, wrapping forward to the eye. Leave this wingcase material extending out over the eye for the time being. Cut a strip of black Furry Foam approximately ¼” wide and 1″ long. Bind to the hook with “Figure 8” wraps 1/8″ or so back from the eye. Move your thread back to the tie-in point of your wingcase fibers. 6. With the thread now at the rear of the thorax, pull back the pheasant tail wingcase fibers and secure them with a couple of snug wraps. Tie off your thread at this point. Trim the Furry Foam just wider than the thorax, touch the ends with a black marker to finish your eyes, and your nymph is done. I enjoy fishing trout lakes and have spent many enjoyable days experimenting with imitations of the various aquatic insects found there. I like the almost clockwork consistency of basic food forms available at particular times of the day during different seasons. Understand the food available to fish, tie something to imitate it, and enjoy success. Simple, right? Well, perhaps not, but certainly one of the most reliable food forms available is the dragonfly nymph. Prominent in number and large in size, these nymphs are available nearly year-round. It is wise for the fly angler to carry at least a few of these patterns at all times. 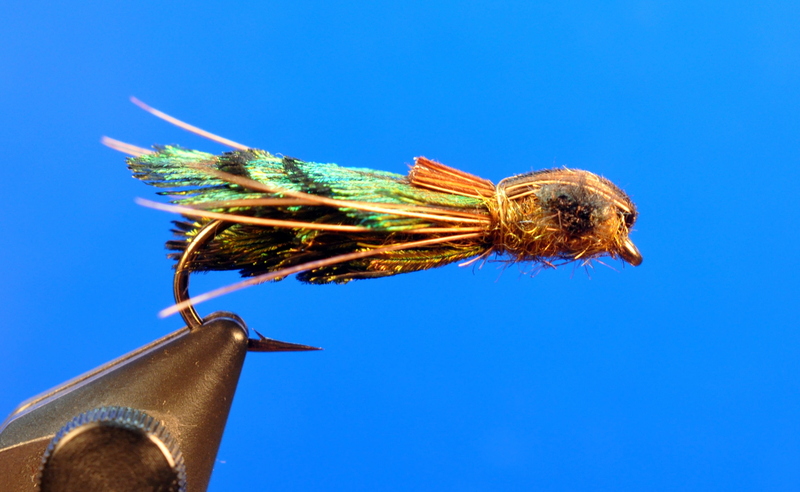 There are many dragonfly patterns – some incredibly realistic – that look wonderful in the vise. However, in the water they often fail because of a “wooden” or stiff appearance. In short, they fail to adequately imitate life. Dull and lifeless are not good features in a fishing fly! Keeping this in mind, my goal was to develop an effective dragonfly nymph imitation that incorporated the appearance of bulk – like the natural – yet shied away from the use of hard and lifeless materials. No V-Rib or drab chenille woven in bi-color dullness. So what to do? I sought materials that would give shape to the body – particularly the exaggerated body width characteristic of dragonfly nymphs – that did not involve wrapping something around a clumsily weighted pre-formed shank. I found my answer in using the green-phase body feathers of the peacock. These feathers have a mottled tan, green, and brown coloration and an appealing sheen to them. This is a perfect blend for this nymph, especially when wet! I use a sturdy 2-3 XL nymph hook in sizes ranging from #4-8. The feathers are applied in sets of two – one top, one bottom – and increase in size as you move toward the thorax. A bit of advice when attaching the peacock feathers is to use two soft wraps to hold the feather in place, then pull it into position allowing a few fibers to be pulled underneath the thread wraps. This aligns the feather on the shank and allows for a slight flaring at the tie-in point. Using Furry Foam rather than bead chain or plastic for the characteristic exaggerated eyes and pheasant tail fibers for the legs continues the theme of using soft materials to create the imitation. The body feathers will compress a bit when worked through the water, and the “breathing” action contributes to the effectiveness of this pattern. I created this pattern to fish the stillwater trout fisheries of the Pacific Northwest and the beautiful Interior lakes of British Columbia. I prefer to fish this fly on a sinking tip line and a stout 4-5 foot leader, though it can be fished on a floating line and longer leader depending on the depth of the water being fished. I’ve enjoyed much success fishing this fly around rocky drop-offs and in areas of downed timber. Spring, summer, and fall, the Peacock Dragon has been a staple in my fly box for years. Try it on your favorite lake and see what it can do for you! 1. Attach thread and tie in a few red hackle fibers (or pheasant tail fibers) for a “tail.” Dub the first body section covering about 1/5 of the shank. A foam disc is also shown, approximately 3/8” in diameter. 2. Bind down the first foam disc to cover the dubbed section; snip the excess and make tight wraps to firmly seat the disc atop the dubbing. 3. The 2nd and 3rd body sections are applied just as the first section, securely adding a foam disc over each dubbed section. Add 10-12 strands of pearl Krystal Flash as an underwing. 4. 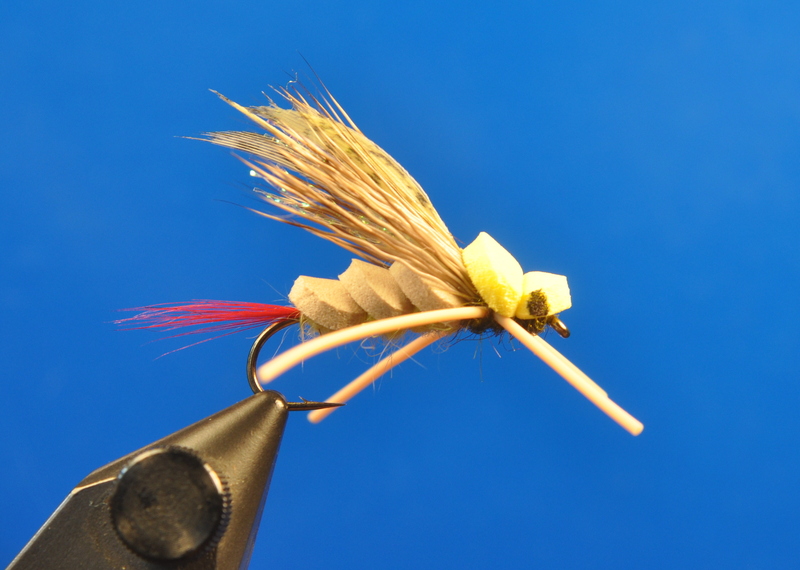 Add two ¼” slips of yellow dyed speckled turkey over the Krystal Flash and cover with a wing of deer hair extending just beyond the hook bend. 5. Add rubber legs material at the wing tie-in and dub the thorax with either Arizona Synthetic Peacock dubbing or more of the body dubbing. 6. The last step is to add a contrasting foam disc at the head which helps push the wing down into place and provide additional floatation and visibility. Move the thread to the eye and whip finish. Add an eye on either side of the front foam disc with a black Sharpie if you like, and the fly is done. Two things seem to have made their way into the mainstream of modern Western trout flies: closed cell foam and rubber legs. Many successful patterns incorporate these materials to various degrees. The Madame X – with its tantalizing rubber legs – has long been a favorite of mine, and all-foam flies like the Chernobyl Ant and the Club Sandwich have gained wide acceptance. Always looking to create, tweak or improve fly designs that work for me on the waters I haunt, I decided to incorporate both of these modern elements while blending them with more traditional materials like rabbit fur and deer hair. I like using foam because of its floatation properties, but am not a big fan of the look of an all-foam body or wing. What I stumbled upon was a much improved terrestrial pattern to add to my fly box. In mid-summer, the days heat up quickly and the afternoon winds blow all kinds of interesting food forms into the water. It is a good time for some terrestrial fishing; specifically grasshoppers. While ants and beetles have long been a staple in my fall fly box, it’s the larger hoppers that can make for some exciting dry fly fishing along our western streams during the breezy days of July and August. Using small discs (approximately 3/8” in diameter) of colored foam, I found a unique way of constructing the body that creates a high floating fly and allows me to combine colors (dubbing vs. foam). I make my discs using a steel golf shaft that is a remnant from my golf club repair days. The graduated steps up the shaft allow for different sizes of discs to be created. I cut the shaft at the desired spot, and then sharpen one end around the perimeter using a grinding wheel. This allows me to “punch” perfectly round discs from the foam in whatever diameter I choose. A common ‘hole punch’ provides a smaller size, and these work great as an add-on strike indicator (for this or your other patterns). The body is built in three sections: each section is dubbed with fur and covered with a foam disc. The disc surrounds the dubbing when viewed from underneath and gives a nice blending of colors. You need to use tight wraps to bind the foam, since it is applied over a bit of fur. I would recommend at least 6/0 thread to bind the foam in place. The sparkle of the Krystal Flash underwing suggests movement, while the wing of turkey tail fibers and deer hair provides overall form and additional floatation. The rubber legs are designed to attract with movement, and the final foam disc of contrasting color at the head can be used as a sight indicator and is important in pushing the wing materials down into place. Without it, the wing would flare wildly upwards! Fishing throughout the summer months, I have had great results fishing the DF Hopper. It floats all day without any treatment and is easily tracked on the water. Banging the banks along a grassy run on a breezy day has provided me with some of the best fishing of the year. It has become a very good searching pattern when the conditions point to the fish looking up for an easy meal. It really is much more than just a hopper imitation. Varying the body and wing colors can give you a variety of chunky meals to offer the fish. I do not leave home without at least a couple of these flies in my vest. I prefer a size 8-10 2XL dry fly hook for the DF Hopper. This disc foam body concept opens all kinds of avenues for various imitations: besides the DF Hopper, the DF Cricket, DF (October) Caddis, DF Traveler (Sedge), DF Golden Stone, etc. 1. Attach thread and tie in a small clump of orange marabou fibers over the hook point to start creating the tail. Cover with a sparse bunch of red marabou and add two strands of orange Krystal Flash to either side. Bind down all materials to the return eye area to form a smooth underbody. 2. Cut a strip of hot orange Edge Brite 1/8” wide and tie in at rear of body. Move thread to mid shank and tie in a length of flat silver tinsel. Wrap the tinsel back to tail then reverse course and wrap back to the middle and tie off. This forms a shiny underbody. 3. Wrap the Edge Brite forward in overlapping turns and tie off. Attach a large webby black saddle hackle or schlappen feather, tied in by the tip, at the mid body point. 4. Dub the front body with black seal for about ¾ of the length and finish with red seal. I prefer using a dubbing loop to give the body a shaggier appearance without adding a lot of bulk. Wrap the hackle forward in 4 or 5 turns and tie off. 5. Add a wing of black squirrel tail, extending to mid-tail or so. Add a couple strands of orange Krystal Flash to the top of the wing. Tie in a red schlappen feather by the tip. 6. Wrap the schlappen 1 – 2 turns to form a collar. Trim off and build a neat tapered head. Add head cement and the fly is finished. 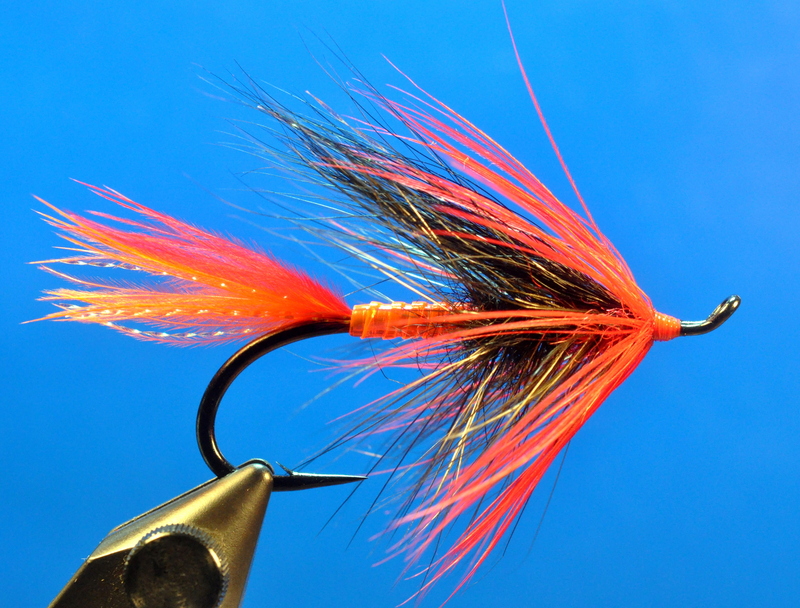 You wouldn’t know it by looking at this fly, but I am a bit of a traditionalist as a fly tyer. I have taken some grief at times from my modernist friends for sticking with stodgy old flies that use mere silks, furs and feathers. I defend myself by yelling “scoreboard” – as I hold my own with all of them – but they like to think I’m stuck in some sort of time warp. While there may be a kernel of truth to that, I am open to anything that will possibly improve my flies. And my fishing. Indeed, when something new comes along that poses interesting possibilities, all bets are off. I remember running across the Dean River Lantern series of steelhead flies originated by Art Cohen. While the patterns themselves were rather simple affairs – squirrel hair tail, a colored body wrap, and a matching collared hackle – I was intrigued by the shiny, glowing body material. It was called Edge Brite, and I filed that away in my memory. On a subsequent trip to the fly shop, I found this unique vinyl material. I walked out with three or four colors of Edge Brite and started running through ideas for incorporating it into my flies. Inspired by the Dean River Lantern, but wanting a more robust fly, I set about creating what turned out to be the Orange Crush. Though there are more components and tying steps to the Orange Crush than to its inspirational predecessor, it is nothing too complicated. Tied in sizes #2 – #2/0 it is designed to move a bit of water, provide a strong hot spot of color, and present a traditional silhouette to the fish. 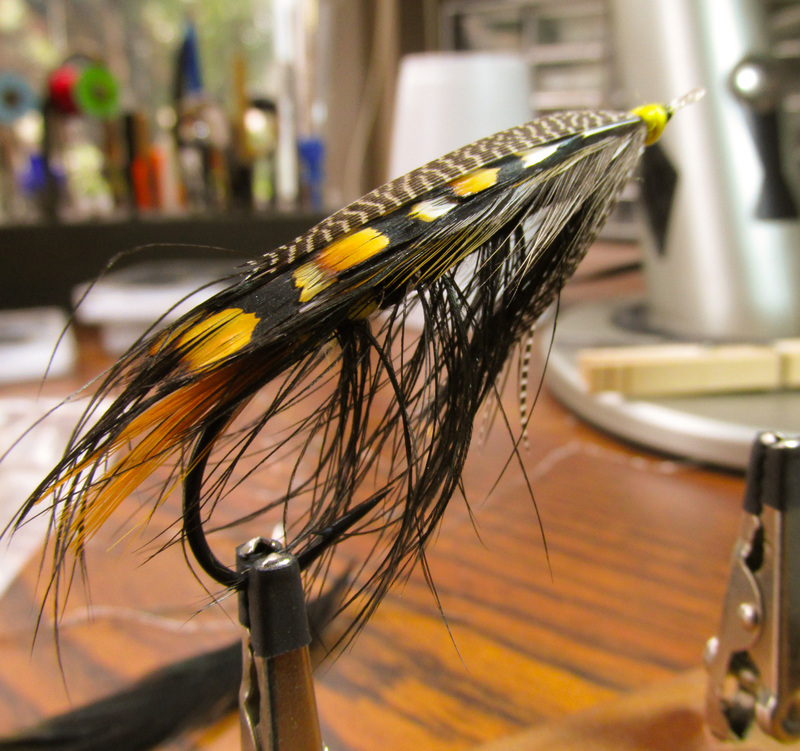 It blends three of my favorite colors for a steelhead fly: orange, black, and red. The key to making this fly really “sizzle” is wrapping the Edge Brite over a layer of flat silver tinsel. This makes the fly much brighter than simply covering a base of tying thread. The Orange Crush is particularly effective in low light conditions or in turbid water. After a couple of iterations, the fly was officially christened on a trip to one of my Oregon coastal stream haunts on a frigid winter day. The fishing had been slow according to the few hardy souls my partner and I encountered along the way, but we pressed on. Noting the off-colored water and wanting to try something new, I thought it a good time to try the Orange Crush. It proceeded to make the trip a particularly enjoyable outing that resulted in a beautiful, bright winter steelhead brought to hand with another solid hookup for good measure. We decided the experience finalized the recipe, as it certainly proved its worth that day. The Orange Crush has since been fished all over the Northwest by myself and my friends from Southern Oregon to British Columbia. I don’t know that it has yet been fished on the Dean, but I can promise you that it will be the first fly out of my box if I ever make that trip!